To-do lists can be your best friend or your worst enemy. You know, the pure satisfaction that comes from crossing through to-do’s, that feeling you get at the end of the day when you’ve checked everything off the list. That, plus your productivity skyrockets when you use them effectively. But a poorly managed and unrealistic task list, on the other hand, can leave you feeling overwhelmed and ready to give up. We asked members of the Young Entrepreneur Council to share their best-kept secrets for managing to-do lists. Take these, add your own best practices and develop an efficient plan that works for you. Sometimes an item on the to-do list might get pushed back because something more important came up. But too often we like to justify a moment of procrastination by calling it “prioritization.” There’s a big difference between those two terms. To stay on track, I suggest finding an accountability partner (or two) who can hold you to achieving the goals you set for yourself. 2. Identify three top priorities each day. Once you write your long to-do list, highlight the three things you must accomplish in order to be productive and priority-focused that day. Don’t fall for the thrill of easy wins. 3. Estimate the time it takes to complete each task. If you have downtime between meetings, for example, you can easily knock off a few items on your to-do list if you estimate they will each take a couple of minutes to complete. When you have longer available blocks of time, you can focus on heavier tasks that might take between 30 minutes and several hours to complete. 4. Create a “to-don’t” list. 5. Schedule each action item on your calendar. A to-do list is only as effective as the action you put behind it, and the best way to get things done is to schedule them on your calendar. When you know something needs to be done, set aside time to do it. If it’s something that can be done quickly, do it then. If it takes more time than you have right now, schedule it on your calendar when you do have time. In today’s digital age, you don’t have to limit your to-do list to pen and paper. Task management systems can allow you to create virtual to-do lists with deadlines, priorities, multiple tasks and much more. Most of these are simple, intuitive and don’t require a computer expert to set up. Don’t limit yourself to the Stone Age when it comes to something as important as your productivity. 7. Review your list at the start and end of the day. Schedule time at the end of every day to evaluate your to-do list. What was accomplished? Cross it off. What’s still pending? What’s the priority? Cull, organize and prioritize the list. At the beginning of each day, review the task list that you left prepared and schedule out your day based on your to-do list and priorities. Too often, we make a to-do list with every thought that comes into our minds, which leads to long and detailed lists that can be daunting. The key to an effective to-do list is to prioritize the list and then focus on a singular task at a time. Don’t overwhelm yourself by looking at the length of the list. Focus on the first task, then move down the list one step at a time. 9. Purge your list daily. 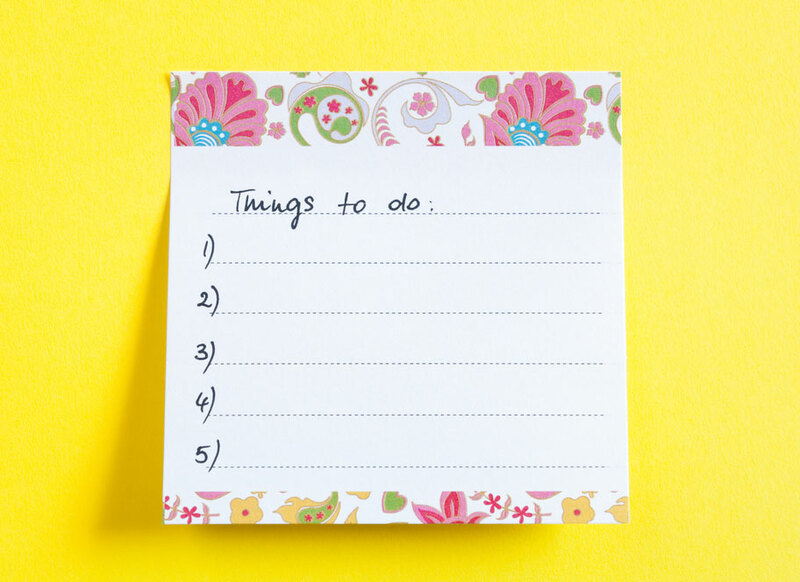 A to-do list is for short-term tasks: single action items you intend to complete within seven days. Items that don’t fit these criteria should be removed. If anything on your to-do list requires more than one action, it’s a project. Remove it from your list and use a project management tool. Once an item is on your list for seven days, do one of the “3 D’s”: drop it, delegate it or do it right now. 10. Use it for everything you do. Use the same list for work and play. When you combine work and personal activities (and that includes leisure time), you create a habit of using the list. Whether you jot tasks down on paper or use any one of the online to-do-list apps, the more consistently you use a list, the more effective it becomes. Big presentation due? Grocery lists? Doctor appointment? Everything needs to get done, so put them all on the same list. The best thing to do is make the tasks on your to-do list realistic. As much as you would like to finish all of your current projects, most people overload the list and make it impossible to check each item off by the end of the day. Adjust your expectations so you can feel good about crossing off those to-do’s, making you feel more accomplished and refreshed.